Fallout 4 Christmas Ornaments | Nerd Much? 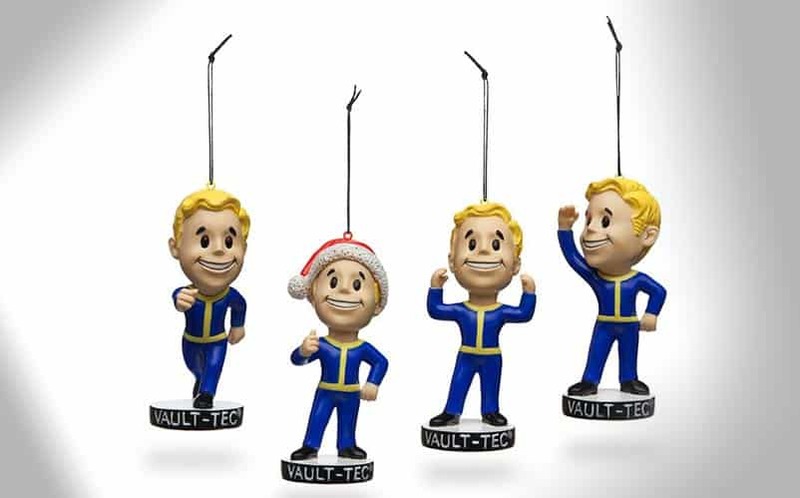 The Fallout Vault Boy Christmas Ornaments come in a set of 4, and Bethesda says they’re modeled after Endurance (so you can run from Deathclaws), Strength (cso you can punch those pesky raiders into bits and pieces), and Perception (so you can spot those Cazadores from a mile away). There is, of course, a new Holiday Spirit stat as well, so you’ll get those extra points needed to keep you in the holiday spirit. The ornaments are all created with a resin material, and they’re 3.5″ tall with a 1 1/4″ diameter base, and they weigh just two ounces each (roughly the size of a Funko Pop vinyl). The Endurance Vault Boy uses the default running motion, the Strength Vault Boy uses the default arm flexing motion, the Perception Vault Boy uses the default exploring motion, while the new Holiday Spirit Vault Boy is wearing a Santa Hat, while also proudly giving a thumbs up. They’re intended as Christmas tree ornaments, sure, but they also have the base in case you want to set them around the house after the holidays. Although you can’t use them to make your Fallout 4 settlement any merrier at the moment, they’ll give you those much needed skill points to take on the Murlock Queen. For more cool nerd stuff to buy, stay tuned to Nerd Much for daily finds. See more cool Fallout stuff.